Datre answers Jan and Lee. DATRE: You have it right. Everyone has a ‘thrill’ gene; you all have the same things available to you. The only thing is, you pick different things to experience. I mean, where is evolution, if everybody does the same thing, if everybody’s interest is the same? So you choose what you want. If you’re smart enough before you come in here, you also build a body so it will accommodate that which you want to do. Now, if you want to sky dive, you’ll build a body for yourself that will be able to do that. Whatever you decide to do, you make accommodations. You had a president a long time ago that was sickly and as a child he couldn’t do a lot of things and who’s that? JOHN: That was Teddy Roosevelt. DATRE: All right. Anyway, he decided that he wasn’t going to be sick any more and did everything he could to strengthen his body to accommodate what he wanted to do. There are many that do that. Then you could say, ‘well, why are there those that sit in wheelchairs?’. That’s what they want to do. They want to experience from ‘that’ vantage point. You don’t know what other experiences and expressions that have been achieved at other, shall we say, other time frames. So the thing is, that you’re always looking for something new. And each time you jump into a body, that is what you call ‘alive’; you want to do something different. Now, somebody will say, ‘well, how come I can’t do this or I can’t do that or I can’t do something else?’. Time is simultaneous, how do you not know that another expression of you is not doing that same thing that you want to do now? ‘Well. I’m unable to do that, why can’t I?’ Well, why should two expressions of ‘you’ be doing the ‘same’ thing? So, find something to do that is satisfying. Don’t sit and complain about what you haven’t got, find something that you can do and be content with what you have. See, that’s what some peoples don’t understand. Some people that don’t have any money, they have rundown houses, they enjoy sitting on their porch talking to people. Then they say, ‘well, I don’t understand that person has no ambition, they don’t want to do anything, all they want to do is sit and talk to people.’. So, that’s what they want to do. You see everybody can’t be the same. Maybe that person sitting on the porch talking to people has another expression that’s working very hard and being successful. So, you know, peoples that look at other peoples and make ‘judgments’ are not helping themselves at all. That’s why we talk about OBSERVING. OBSERVE that person, watch what they’re doing, if you want to ‘interact’ with them – fine. If you don’t, that’s up to you and that’s fine too. But, its the trying to help ‘other’ people and make ‘judgments’ as to what they should be and ‘how’ they should live and if a person wants help and asks for help, that’s one thing. But, if a person is content the way they are, then find out what they’ve got that you don’t have. So, if you want to experiment with things that are – what you call – dangerous, then go ahead. Maybe you’re thinking, what will happen if I have an accident, how will I function from that point? 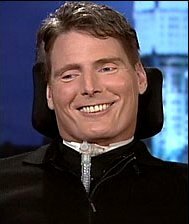 I think everyone knows the actor Christopher Reeves, who is in a wheelchair, that got hurt falling off a horse. And he is totally… he can’t manipulate his body and he can’t breath. Now, prior to that ‘accident’, he had worked in a movie where he had played the role of that type of individual. Now, take a look at that scenario. He tried it out in the movie to see if its something he really wanted to do. Then, he decided to do it. The type of ‘accident’ he had is what they call, one in a million. If he hadn’t done it that way, he would probably have done it doing something else. But he was doing what he wanted to do. But, you see what he’s doing, he is bringing people into the awareness that something needs to be done for people that have these type of ‘accidents’ occurring to them. He’s also supporting his family by making movies. You see, what he’s doing, he’s pushing every ‘button’ to the limit and that is the way he has always lived his life. But, you see, it is up to ‘you’ to decide ‘what’ you want to do and ‘how’ you want to do it. If you want that ‘thrill’ – go for it. If you don’t, that is all right to. Each one does their own thing. That is what ‘evolution’ is about, because, you may not be aware of it, but at another level everyone benefits from every experience that ‘any’ individual on the planet is having. Regardless of ‘time’, ‘space’ or anything else. Because what you are doing is, expanding the ‘awareness’ of the ‘whole’ – of what you call – humanity. DATRE: Because you ‘want’ to. We’ve said that time and time again. If you didn’t want to be here, you would be someplace else. You don’t realize – you don’t ‘have’ to be here. It was a decision that you made that you ‘wanted’ to be here. Every part of universal expression, be it in a physical construct, be it without physicality, is ‘experimentation’, ‘exploration’, pushing the ‘boundaries’. Pushing the boundaries for not only your own ‘evolution’, but for the whole ‘evolution’ of everything that exists. You don’t realize how ‘important’ you are, because each and every one of you contributes to that which ‘is’. Where would humanity be, if at the time it was first put into motion, that everyone just sat down and said, ‘let’s sit here and wait and see what happens’? I hate to say it, but that’s what a lot of you do. You sit down and say, ‘well, I’ll wait to see what happens’. Anyway, next question. DATRE: I guess we just answered that. You ‘were’ without a physical construct. Then you decided that that’s something that would be fun. Nobody told you you had to. Nobody in the universe tells anybody they have to do anything. The ‘creators’ in the universe are creating all the time. JOHN: The creators are also walking around in human form – that’s us. DATRE: Well, everyone… that’s true, but what I was going to say, that there’s creators that are creating ‘all’ the time in the Big Universe. They start a project and they get just so far with it and sometimes it doesn’t work, sometimes they ‘scrap’ it. Sometimes they say, well that’s good enough, let’s take that one and see where it goes. That’s what happened when they first decided upon that which you call ‘humanity’. Then, as the ‘human’ began to get more ‘expression’, then more of them said, ‘you know, I think that would be kind of fun to ‘explore’ humanity’. So, they sent a part of themselves in and put it into physical containments called bodies. Now, you see, the thing that is hard for us to explain – and you ‘still’ don’t understand it but sometime, something will ‘click’ and you will – Where are you when you are asleep? Now, you’re out roaming around doing gillions of things. Why be in a body? There’s no reason to be, the body can take care of itself. That gives ‘you’ a chance to connect up with ‘others’ to ‘plan’ your plays, to plan your events, to plan your scenarios. Then you jump into physicality and say, ‘now, I hope I remember this’. Then you get into physicality, you wake up and it’s the same as yesterday. Now, the OBSERVER wakes up and says, ‘no, this isn’t the same as yesterday, I wonder what’s going to happen today?’. Then, as being an OBSERVER, their day takes on a whole new type of ‘magic’, because, by getting out of your ‘own’ way, you’ll discover all sorts of interesting things. But you keep yourself in the body in such a state of ‘have to do this, have to do that, this, that, that, that – that you don’t ‘relax’ enough. Then when you’re doing this, that, that and that, OBSERVING at the same time – you can do ‘both’. If you are so stressed out that you can’t OBSERVE your actions, then there’s going to be no fun. If you were to ‘relax’ in the body and get up in the morning and ‘watch’ what you’re doing, watch what the ‘bodies’ doing – it becomes more interesting. It’s interesting how you can ‘watch’ the body go downstairs or go into the kitchen and make breakfast. The body knows where everything is and if you ‘watch’ it, it becomes very fascinating. You see, they think meditation is ‘grand’. It’s more fun being in the body and ‘watching’ the body. But, that is for you to discover. Continue. JOHN: That was the last question from Lee.